A Centacare program designed to help ease the burden of back-to-school costs is helping families in regional Queensland. Source: ABC News. Centacare Far North Queensland’s School Savvy program has been running in Cairns for the past two years, providing low-cost stationery, shoes and used uniforms. Cairns mother Andrea Attree has been using the program since it started to ease the pressure on an expensive Christmas period. “This year, compared to the previous years, the price of uniforms has … gone up quite significantly,” Ms Attree said. After a successful pilot program in Cairns, Centacare Central Queensland has set up the School Savvy pop-up shops in Rockhampton, Yeppoon and Mount Morgan. 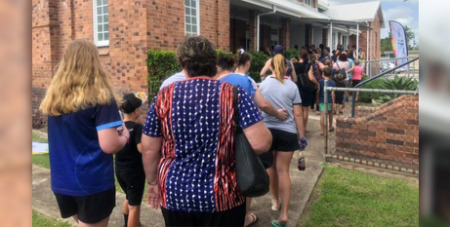 School Savvy Central Queensland organiser, Anna Morris, said the organisation had been overwhelmed by the demand for the service. “It is concerning to see how desperate people in the region are for it, so we’re glad that we can provide this initiative,” Ms Morris said. The program relies on donations from local businesses and the general public. “Either monetary or stationery donations and we’ve had lots of people jump on board so it’s been really heart-warming to see,” she said. The program aims to expand statewide. Financial counsellor Terry Curran said he was not surprised by the strong demand for the School Savvy program. “Research done in 2016 indicated that roughly 50 per cent of the working Australian population was actually living paycheque to paycheque. I would think that that figure has increased,” Mr Curran said.